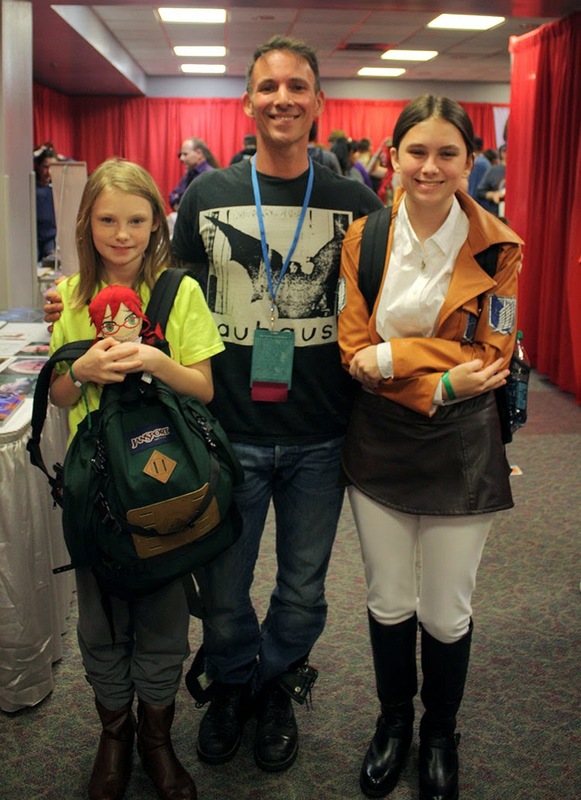 Over the weekend, Pat and I got a chance to let out geeky flags fly and take two of our nieces to Pensacon 2015 in Pensacola, FL. This was only the second year this event has been held, but it was packed out! Looking down onto the vendor floor, this doesn't do the crowds justice! I think all four of us could have spent the entire time just people-watching; there were so many amazing costumes. I'm still not sure what this is, but it was creepy-cool. It took a little time to get on the vendor floor as there was a line, so we got the opportunity to sit in the stands while we waited. This provided us the perfect opportunity to come up with a game plan and sit back and watch all the awesome around us. 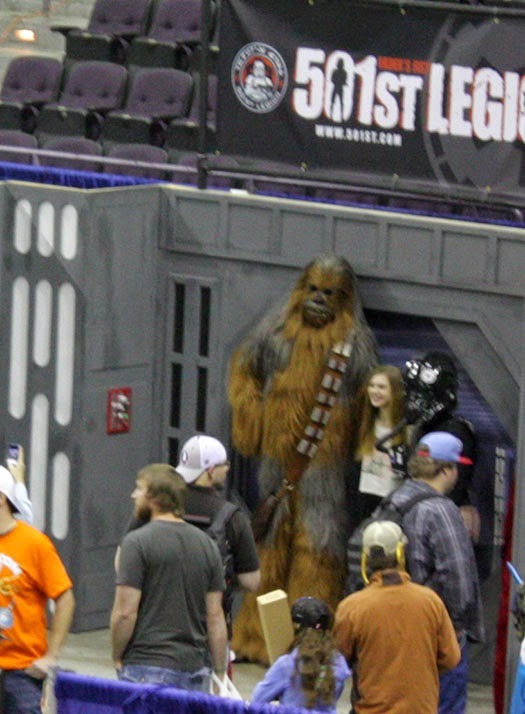 We could see these pictures being taken of a life-size Chewy, but he was gone by the time we got on the floor. Darn! Once on the Vendor Floor, we stuck to our zig-zag route and perused all the wares. I got to speak to some local people I know who were vending there; Chris at Black Flame Creations (amazing Steampunk art and wearables) and Jon from Mini War Game (who I blogged about last month). Again, there was lots to take in. This elf in chainmail caught my eye even from where we had been seated. The hours of work that must have gone into that armor. . .one can only imagine! 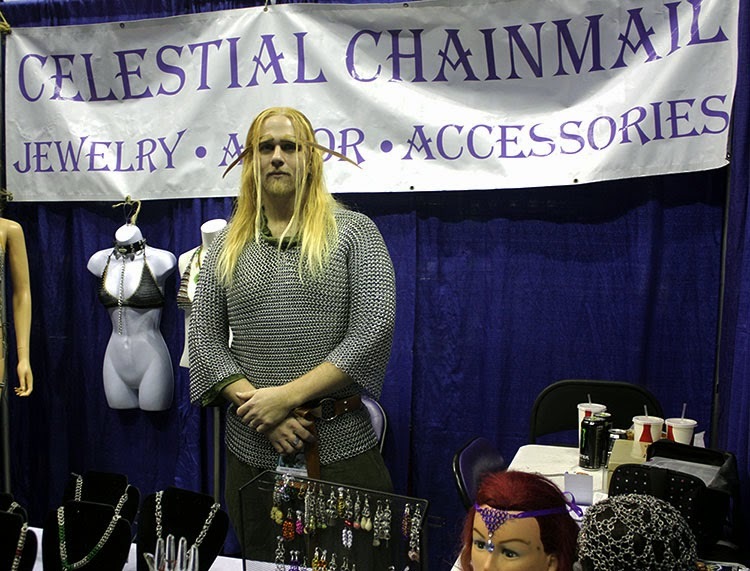 Another vendor stole my attention in his 'armor'. 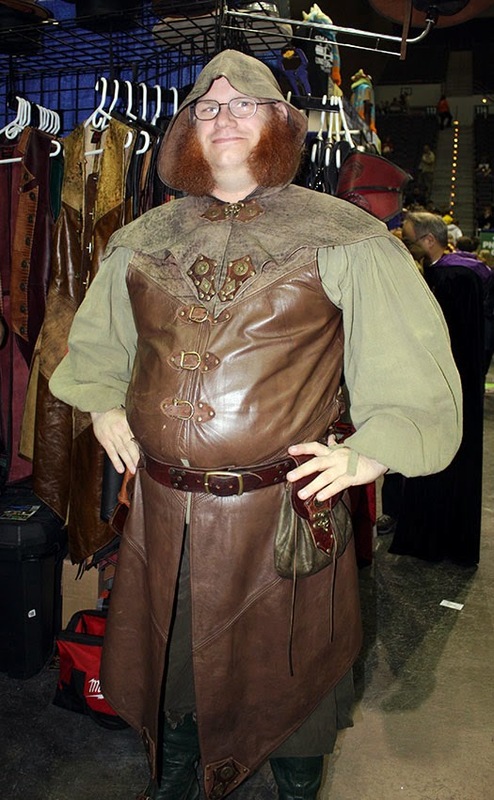 He was selling a variety of leather-goods. However those amazing chops are what caught my eye! This gentleman made me laugh out loud as I spotted him dozing away in this skull throne. After leaving the vendor floor, we decided to check out the Celebrity and Autograph area. We were concerned that the lines in there would be even more out of control, but it was surprisingly manageable and not overwhelming. We got the chance to actually see stars from some of our favorites: Star Trek, Star Trek the Next Generation, Game of Thrones, Harry Potter, Mallrats, and many more. Of course, our favorite of the bunch was Noah Hathaway who played Atreyu in The NeverEnding Story. He was a big part of the reason we decided to go to Pensacon and not some other local con, and I told him that too. Yes, we got to meet him!! Next to him was Alan Oppenheimer who voiced Falkor, the Rockbiter, G'mork, and the Narrator in The NeverEnding Story. He was also the voice of Skeletor and Vanity Smurf. (Can you say 80s swoon!?) Actually, if you take a look at Alan's IMDB page, you'll see he's been in just about EVERYTHING. His resume is impressive to say the least. We didn't get a picture with or of him, but did get his autograph (and Noah's). Meeting these two individuals was the highlight of our day. Once we had our fill of celebrity sightings, the four of us held a pow-wow to look over the schedule and decide if there were any other must-dos before we headed back home. There were lots of options: video game playing, parties, panels, Q&As, a costume contest, etc., but we all felt pretty fulfilled in what we had accomplished and were near exhaustion from the excitement. We caught a bite to eat down the street and headed home. There was no Tardis to take us home (I know I'm oversimplifying the use of the tardis - forgive me), but the hour drive wasn't so bad. I will say that we had another group of friends there who had a completely different experience from us. They went to a panel and checked out a local restaurant that was decorated for some of the parties with lots of really cool pieces. It sounds like they had a great time too, despite the fact that our paths never crossed. There was just so much to do! All in all, I think there was something there that would interest just about anyone. 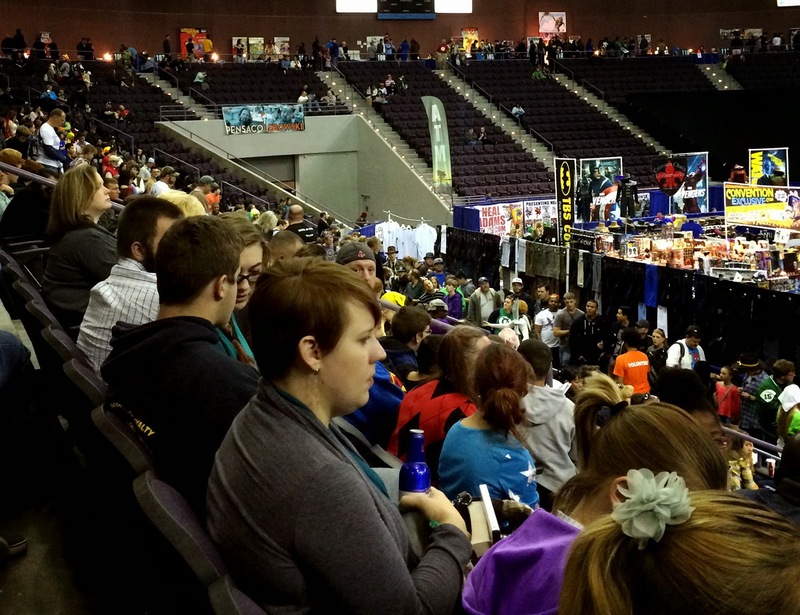 The Pensacon organizers should be proud of themselves and congratulated for putting on a great convention. It rocked, and I've got two nieces who declare that it was one of the best days of their lives! That angel was awesome. 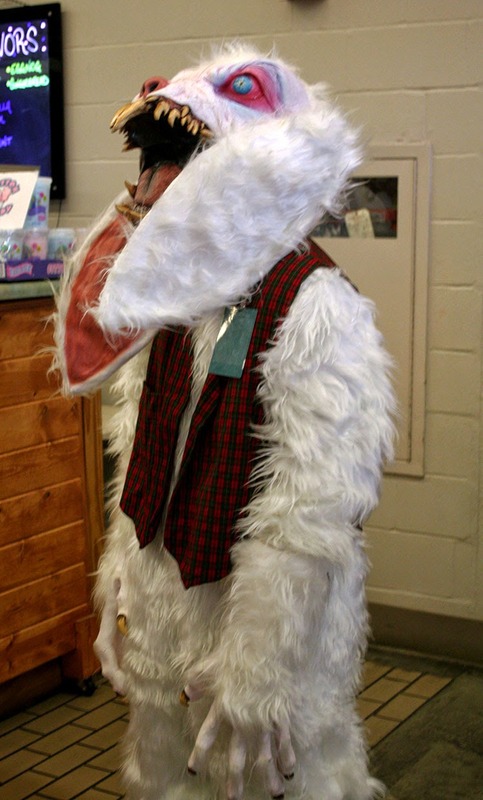 I think it won a best in show costume award. Thanks for mentioning Black Flame Creations. The booth did phenomenally well. 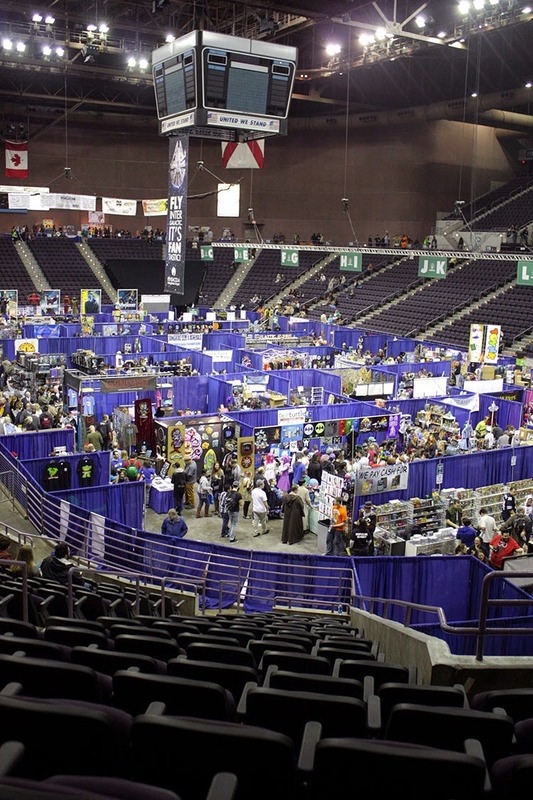 I just hope Pensacon gets a bigger venue for next year. They had a great advertising campaign and what was done with the airport was genius. What a fun event. I'll bet the girls were so excited to be there. That sounds like so much fun! Before my husband became disabled, we used to attend the sci-if cons since he would be on the panels. It looks like y'all had a great time and saw a lot of interesting people and stuff. Thanks for sharing the photos. I like the angel, and I liked the contrast of the Marine, in uniform, behind her. Looks like a great event, and I'm glad to see it's getting bigger. Alan, So glad you like the photos. Yeah, it was hard to get any pictures without other people in them. There were all kinds of people in uniform and I'll admit that at times I wasn't sure if they were actual military or in some kind of costume. As far as the event. it was a lot of fun.